So, I have a crazy update here for ya. A really, really crazy update. So, back in March during my Spring Break, a few friends and I decided that we wanted to venture out to the Eastern Sierra's. 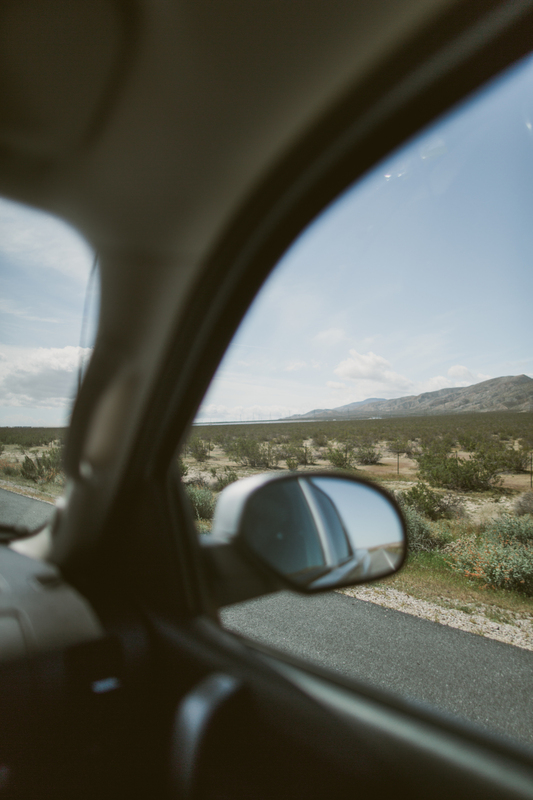 I have been to the Eastern Sierra's a few times, mainly up near Mammoth Mountain and June Lake; however, there are so many places in between Fresno and June Lake that I have not ever stopped to visit and enjoy. So, we planned a trip out! We left Fresno a little after 8pm when we were all off of work and class and inputted the location of Lone Pine, California into our GPS. The drive was about 5 1/2 hours or so. Time passed super quickly on the drive over and as my friends slept, I was continually astonished by how beautiful the Eastern side of the Sierra Nevada Mountains looked illuminated by the moon and covered by low clouds. The drive up HWY 395 is certainly a beautiful one. Driving in between rock canyons and through flat deserted lands really has a way of moving one in quite a different way than the mountains do. Around 12:30AM we finally pulled into the quiet little town of Lone Pine. I was glad to have made it to the town smoothly without any issues. 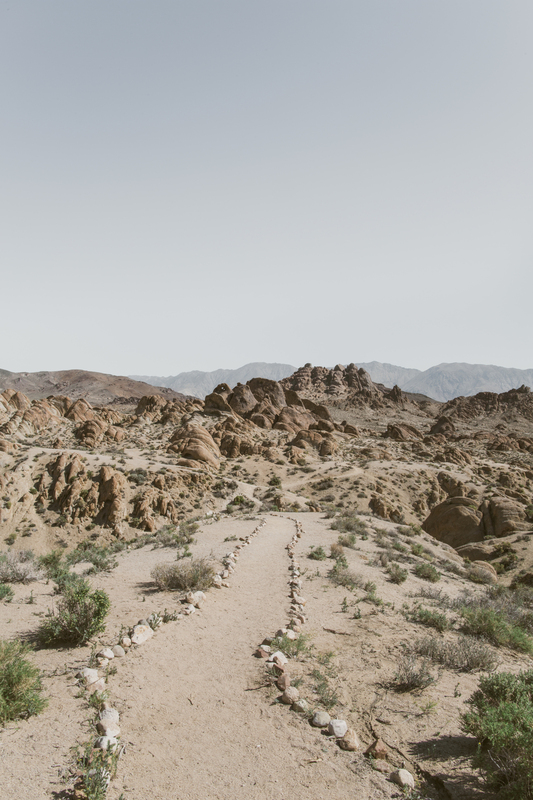 We decided that we would set up camp in the beautiful Alabama Hills off of Movie Road. We started toward Whitney Portal and quickly found the Movie Road turnoff. It was fun to go off the paved road onto a bumpy dirt road. My Chevy Tahoe bobbed up and down with every dip and ridge in the dirt road. We didn't take notice of everything shaking back and forth because we were so distracted by the beautiful view of Mount Whitney in the distance. Soon, we reached the Mobius Arch trailhead and decided that we would set up a tent in the general area. We stopped the car and quickly got out to stretch our legs. I walked to the back of the car to let TJ, my pup, out of the trunk. For a few good moments we all just stood around with our backs toward the car and our faces toward Mount Whitney just staring in awe. Nothing has ever seemed more peaceful and beautiful. It was so calm out there; quiet really. As we were meandering around I pulled out my camera and decided I would try to get some shots of the area. It was at this point that my friend, Ryan, directed my attention to the car saying "Wow, look how crazy the moving dust looks in front of your headlights!" I darted my eyes to the car thinking, 'that's odd, my car has been off for a good 4 minutes, the headlights shouldn't be on'. . . It took a moment and then it dawned on me. The illuminated dust flying in front of the headlights was actually smoke. I yelled back a few surprising profanities and "my car is on fire!". I ran to the front of my car and sure enough, under the front left corner of the hood my car was in flames. All at once, the calm surroundings and peaceful feelings seemed to ignite into chaos and desperation with each flame. It confused me because the car never gave any warning signal, nor was there any smoke while I was driving. How could my car be overheating when it didn't give any warning and it's been off for a good 5 minutes? 'This makes no sense', I kept thinking. So, in the heat of the moment, we grabbed all of our water and started drowning the car with it in hopes of putting out the fire. It was a crazy moment of desperation for all of us seeing as none of us had cell service and we were a good 5 miles from town. Within mere minutes my car was engulfed in flames. We tried saving our stuff in the car and succeeded at getting most of it out; but not everything. Ryan took off searching for cell service and I reached for my phone to call my dad. My phone said "No Service" but I figured I would try anyway. Somehow, it must have been a miracle, my phone suddenly found signal (without me moving around to find any) and I got ahold of my dad. This isn't exactly a call a father wants to wake up to from a deep sleep at 1AM in the morning, but I am thankful for how my dad really stepped in despite not being able to physically be there. It was calming to talk things through with him in the moment of chaos. Luckily, Ryan somehow got cell service as well and got ahold of 911 dispatch and quickly relayed the situation. They assured us that all would be okay and that help was on the way. 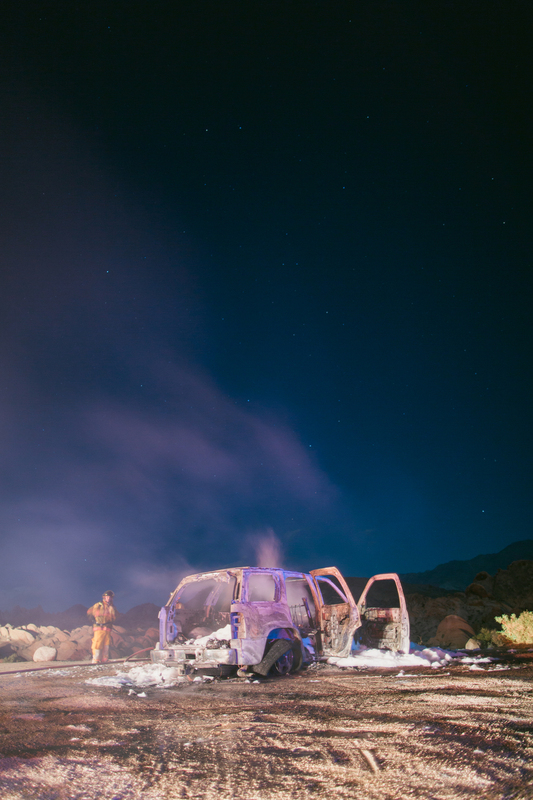 At a certain point, there was nothing we could do; the car was done for and engulfed with flames. 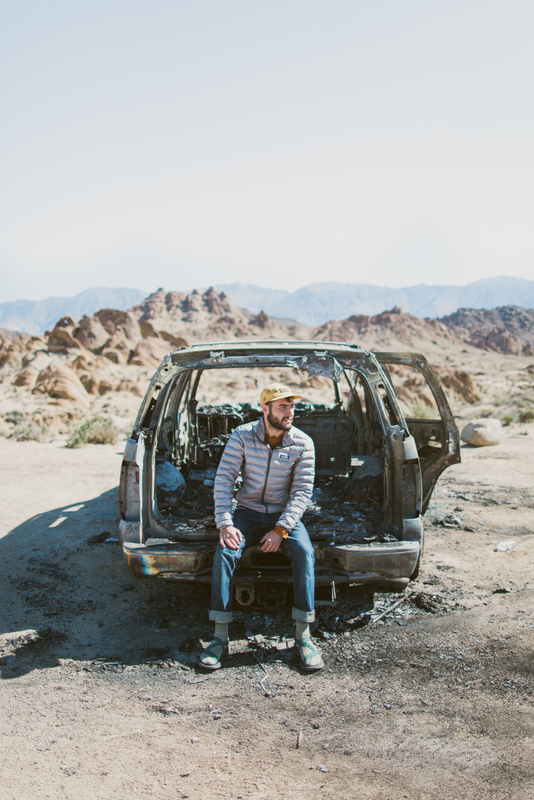 All we could do was stand there and watch my car burn to the ground with the things I hadn't managed to save. I had never felt so hopeless in my life. We stood, waiting. . . waiting for help, waiting for the flames to die, waiting to wake up from this nightmare and realize it was all just a dream. Standing there, I realized that I should be taking photos of this! I want to remember this insane night and also I feel like I would fail as a photographer if I didn't document this through photos. So I pulled out my camera (which I thankfully saved!) and started snapping some photos of the car in flames. Of course, right when I was taking photos the police pulled up. In my mind, I didn't think it was a big deal to be taking photos; but I guess it was super suspicious that I was taking photos of my burning car. All of a sudden, I overhear the cop radio over to other cops saying "Yeah, I have the suspect for arson." Great, I'm a suspect for arson. The following minutes consisted of being asked a series of questions by the cops and fire marshal. 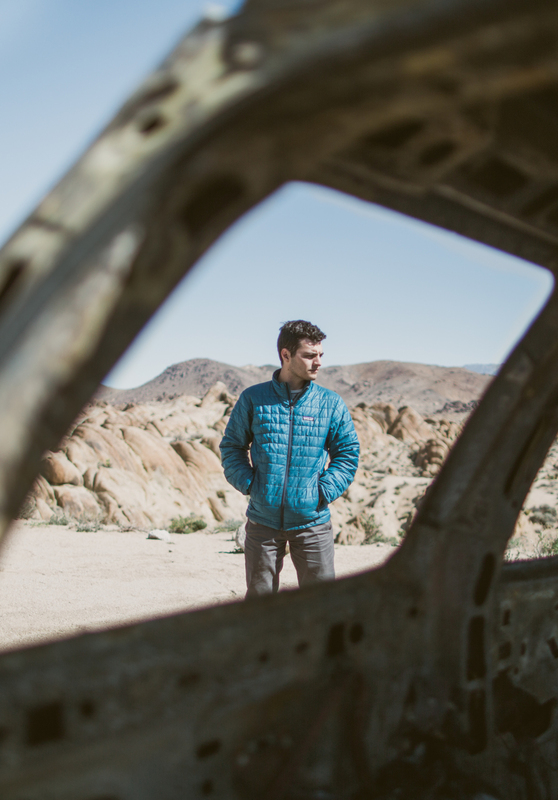 Most of the questions asked pertained to what I had in the car that would cause it to explode. 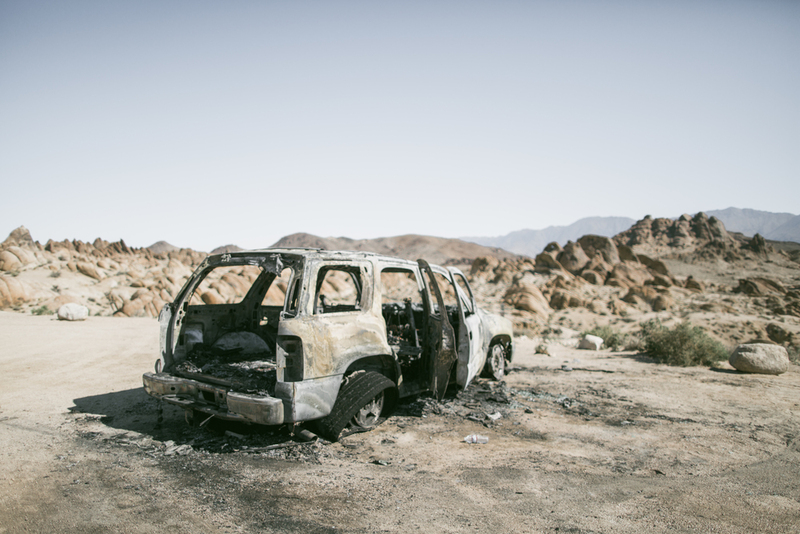 I explained that I didn't have anything in the car that was explosive, nor did I have anything that was extremely flammable or cause explosions in a fire. 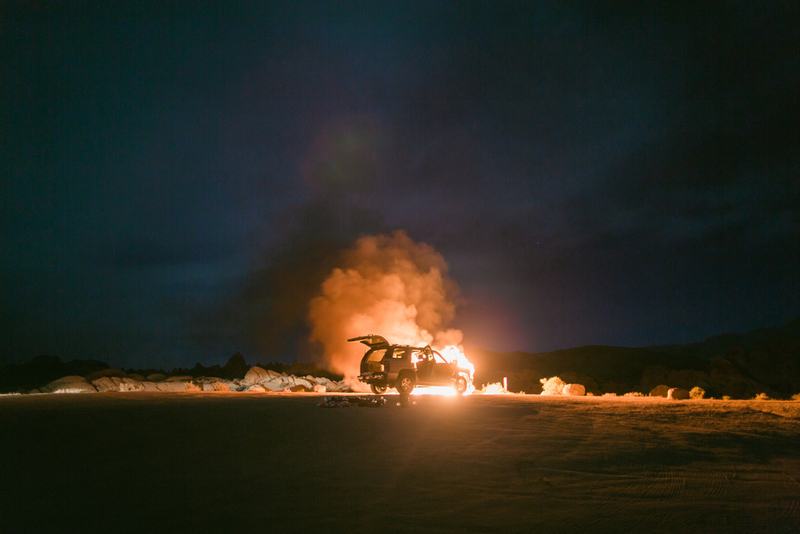 I was also asked a series of questions as to if I set the car on fire intentionally. I had to explain that I did not intend to set my car on fire; and if I had, why would I bring a trunk full of camping gear, have my friends come along, bring my 5 month old puppy, not arrange a getaway car, and car 911? 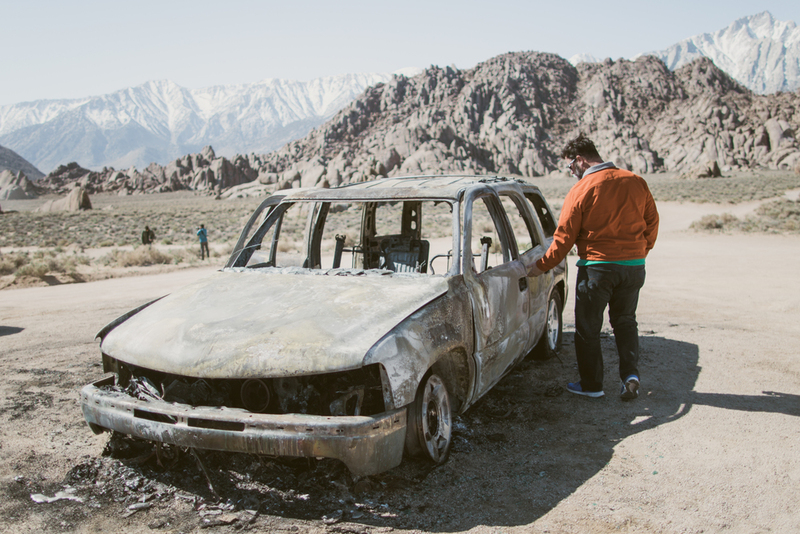 I didn't commit arson and my car is on fire not by my intention. 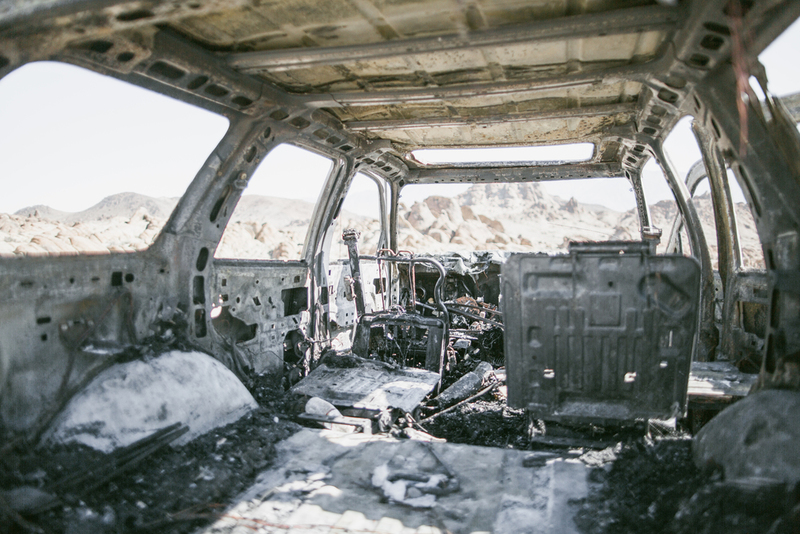 Once they interviewed Ryan, Jack and I separately, in addition to investigating the car after the fire was put out; the fire marshall concluded that we weren't suspects for arson. 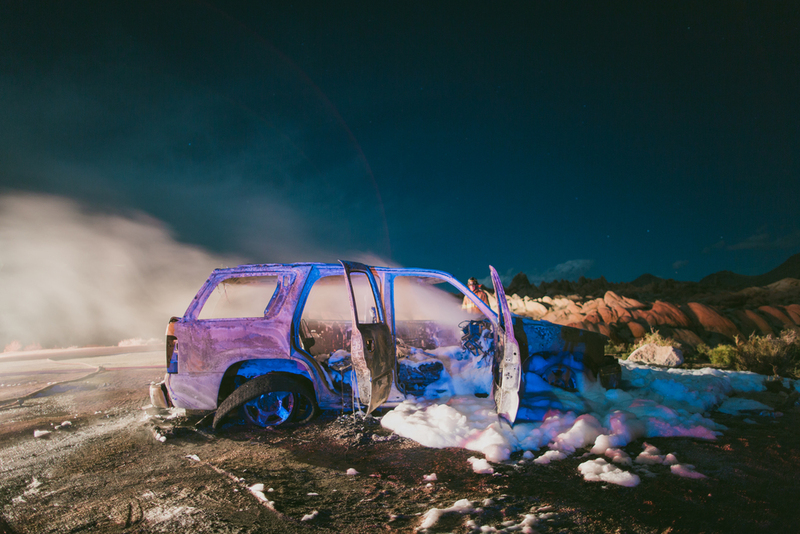 He concluded that the car did not overheat, but that the battery shorted out and sparked a flame causing an electrical fire (which is harder to extinguish and is fueled by water . . . oops). He suspected that while driving over the bumpy dips and ridges of the dirt road, the battery came loose and shorted out. Because of this, the battery then sparked a flame, at which point, there's nothing you can do. The only way to prevent the sparked flame from growing is by immediately removing the battery and putting out the flame. 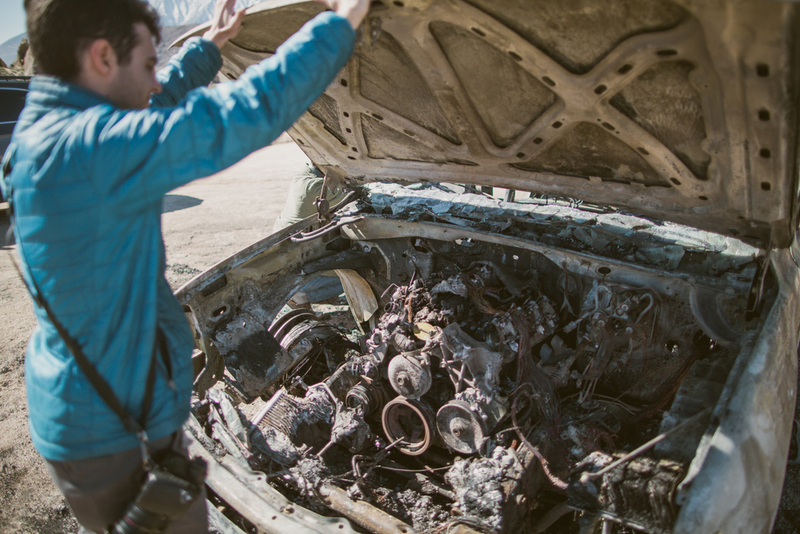 However, when the battery is under the hood and you cannot see the flame until it has already caught multiple things under the hood on fire, there's no way of knowing that your car is on fire. It was relieving to hear that it wasn't all completely my fault, but it didn't help the situation and I was still so bummed. In the time span of 4-8 minutes, my car was completely ash and there was nothing I could do. How insane is that? Luckily, Lone Pine Fire put out the fire preventing it from reaching the bush nearby. I am thankful none of the land was burned, otherwise I would have been looking at a giant federal fine. It was so erie going back to my car after the flames were put out. It was completely covered in foam which a lot of people have misplaced for snow when they see the photos. The ash was intensely strong in scent of smoke. I stood staring wishing that none of this had happened and feeling completely upset. 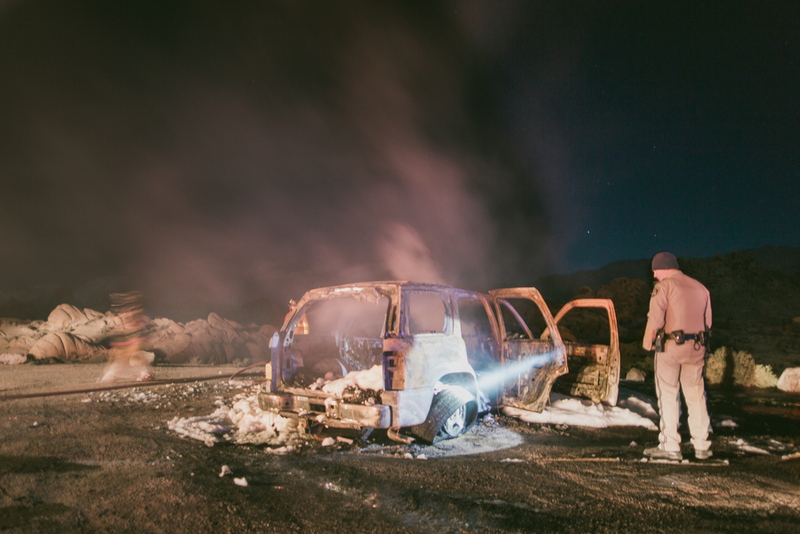 After all was extinguished, the CHP officer and Fire Marshall took us back into town to find a motel to sleep in. At this point, it was 3AM and I had to sit on the phone with the insurance company filing a claim. It was nice to be in a bed for once. None of us had too much energy to really wash up, so we laid in bed that night reeking of electrical smoke and covered in ash (TJ included! Poor pup). It was a long, long night. I don't think any of us got more than an hour and a half of sleep that night. The next morning, my dad drove 6 hours to come pick us up. I am so thankful for my dad. If it weren't for him, I'm not sure what we would've done. The fact that he drove 6 hours to come pick us up and then turned around an hour later to drive us all the way back home is incredible. I love my dad so much. Once dad got there, we headed out to the graveyard sight of my Chevy Tahoe. . . It was insane to see it the next day. My car looked so unfamiliar. And everything in it was completely ash. . . take a look. It was crazy, nothing seemed to truly survive this fire. All of the belongings I had in the car seemed to be just ash and even the car itself was just completely burned. As I continued to stand there staring into the car, I noticed something. . . In the midst of ash and scraps, I noticed something entirely recognizable. It was my favorite Stanley Thermos!! I couldn't believe it. Nothing survived that fire except for this! I climbed into the ash filled car and reached for the thermos. I pulled it out of the solidified mound of ash it was nestled in. It was still one piece, fully in tact. Completely whole! Nothing missing except for the side handle. Despite the fact that the entire exterior of the bottle is completely burned black unlike the original classic green color, it held up during the massive fire that burnt down an entire SUV. And believe it or not, but it even still had coffee in it! NO JOKE. This thermos, which was placed in the middle of the car, survived a fire that burnt down my entire car, yet it survived in one piece! I was thoroughly impressed and decided to take the thermos home with me as a reminder of the fact that we survived such a horrible accident. Now, let me tell you, I LOVE Stanley products and I always have. I have grown up using the Stanley-PMI products ever since I was super young. It's been a brand that my grandfather grew up with, my father grew up with, and now I have grown up with. I hope and plan that my children to come will grow up using and loving Stanley;'s awesome products as well. From the time I was young, whenever my parents would take me into Yosemite or even to the lake for a fun lake day, I remember bringing the Stanley thermos along. As I've grown and fallen more in love with the mountains, the Stanley Thermos has become a staple piece of gear for my adventures. So of course I would bring it with me to Lone Pine. I was so bummed to remember that I had left it in the car while I laid in that motel bed all night. But I was so ecstatic to see it survived. 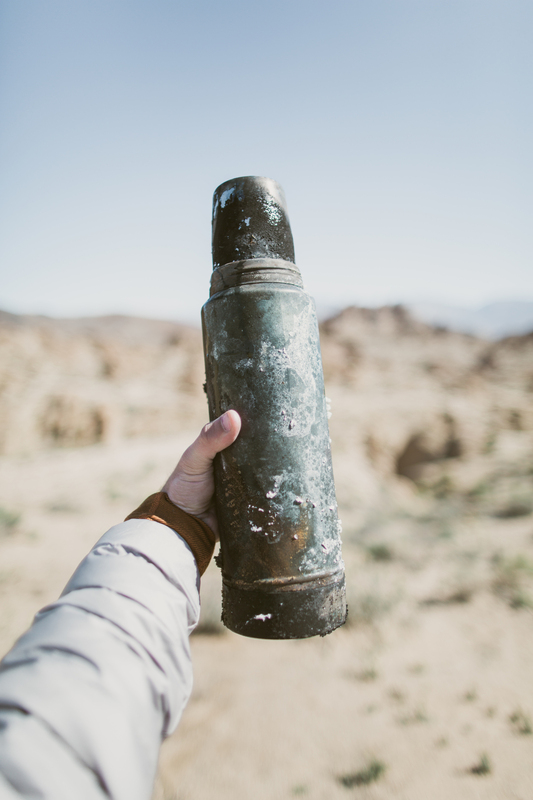 All in all, finding my Stanley thermos proved to me one thing, that Stanley-PMI's products, in specific the classic green steel thermos bottle, is truly a sturdy and trustworthy product that can (and obviously will) survive crazy extremes and circumstances. I mean, fire destroyed my giant SUV yet my smaller Stanley Thermos survived in one piece! I will definitely continue using Stanley-PMI products now knowing that they survive crazy extremes! I trust that no matter what adventure I am on, I will have a Stanley thermos with me. I've already replaced my Stanley Thermos and have also gotten other products from Stanley-PMI now. Seriously, if you don't have a good sturdy thermos, you gotta get one from Stanley. I'm not trying to advertise here, I am just saying from experience. . . their products are beasts and are awesome. 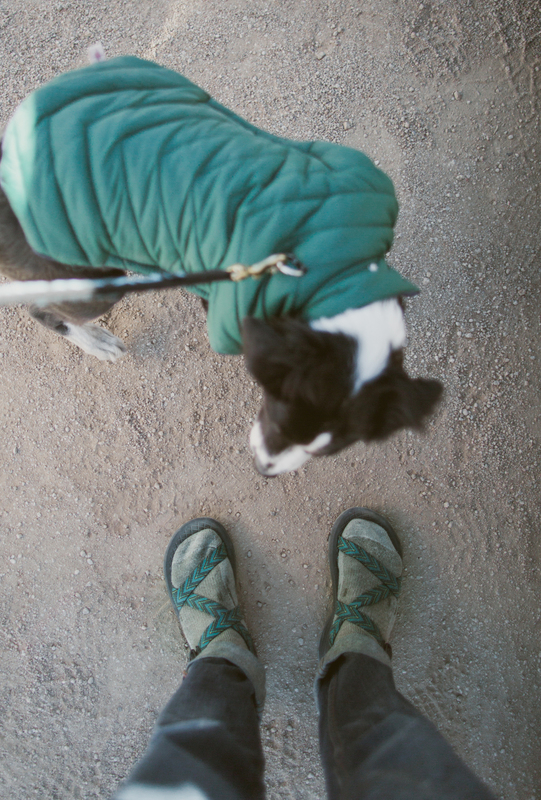 And they've become essential for my hiking, camping, and backpacking trips. 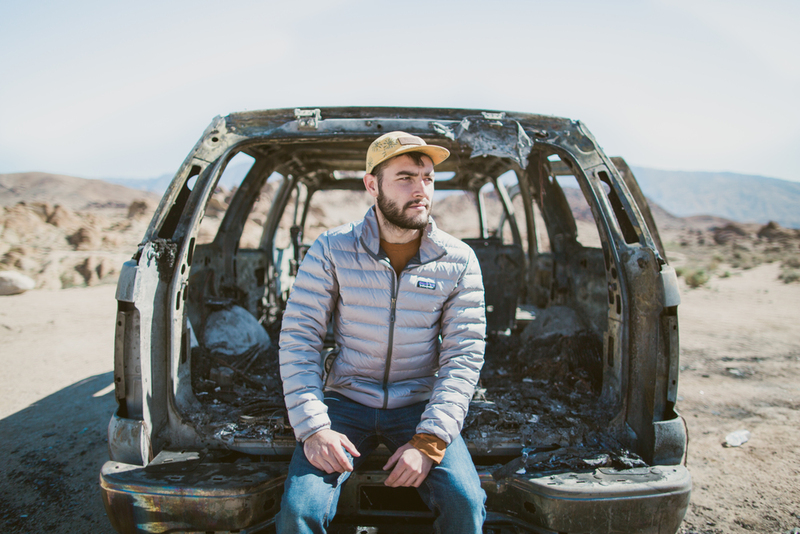 If you haven't heard of Stanley, go check them out; they're such a family oriented brand. If you are interested in any of their products, go check those out too! And let me know, I can give you tips on what products to get! Go check them out here! As a side note, I know my sisters really hate when I wear my chaco sandals (especially with socks), but I love them. However, I was kind of stuck the entire trip wearing these because my really nice Woolrich hiking boots burned in the fire. . . Super bummed. So I was stranded in my chaco sandals and it was so cold that I had to wear socks with them. So, yeah. There's that haha. . . It was a quick, but long, drive home that day. We were all exhausted, dirty, and sleep deprived. 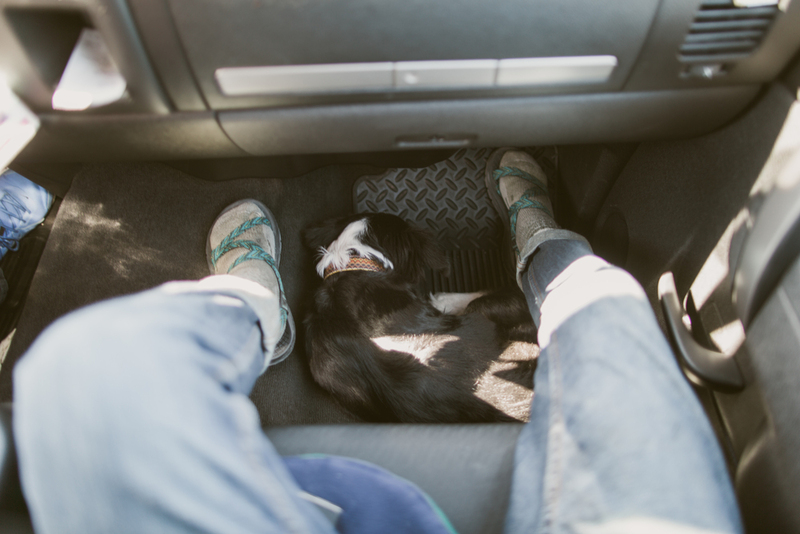 TJ even slept at my feet the entire 5 1/2 hour drive home. He didn't move once! TJ is doing great now after being traumatized. For the few weeks after the fire TJ had major anxiety getting into cars and he was much more quiet than usual. Well, I am glad to say that he is back to his talkative, crazy, hyper self again. At the end of it all, I'm happy to have survived this insane freak accident. 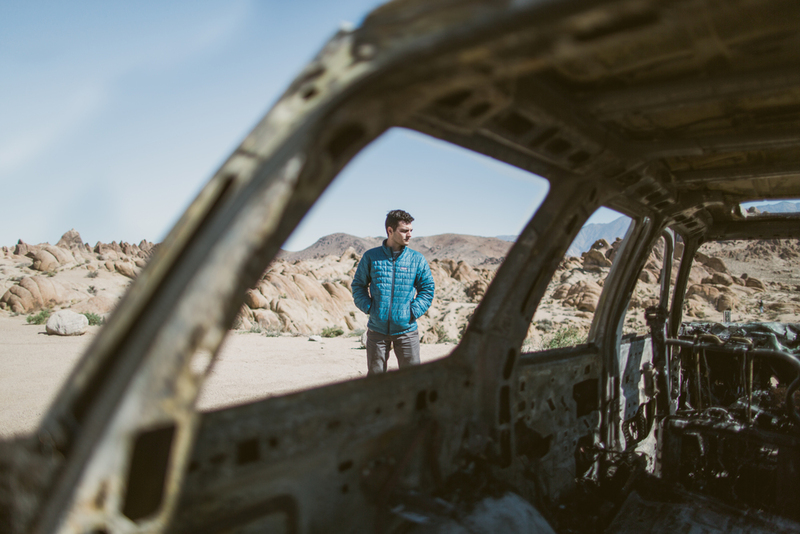 It was so hard leaving that car behind in Alabama Hills, Lone Pine, California. But, at least it died in an incredibly beautiful location, right? I'll never forget this freak situation. I'm bummed we couldn't have spent more time in the area (because I didn't take any other photos, I wasn't in the mood, you know?) and seen some of the beautiful sights, but I know I'll be headed back soon. 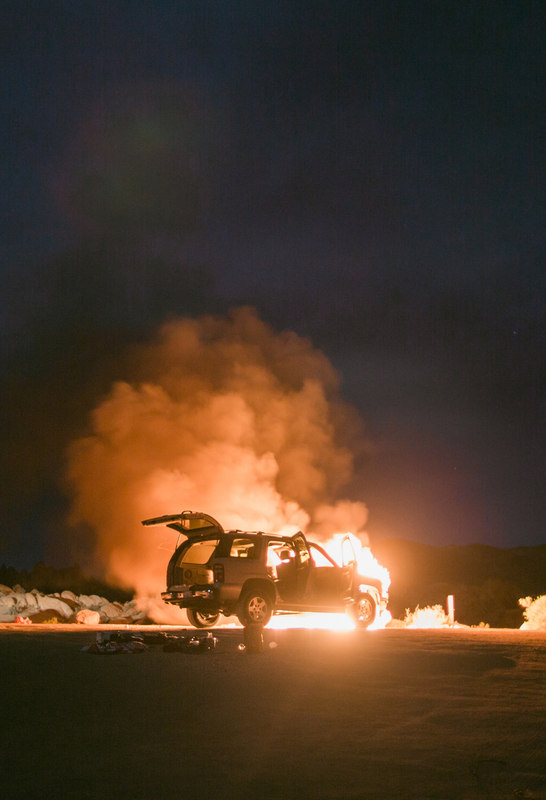 It would be fun to have an annual camping trip in the location where my car exploded. Definitely a Spring Break I will never forget. . . as some would say, "it was lit". . .
You know what I mean? . . .